Amy came and spent some time with us on Sunday which was really nice cause we just hung out at home doing nothing! I don’t think Amy had as much fun as I did but she tolerated it pretty well – she did rope me into a quick trip to Nordstrom Rack in the afternoon! We have spent time seeing friends and playing cards with our old neighbors. Friday night we went to Octoberfest in downtown San Jose at a nice little restaurant, Teske’s. Food was good, beer great, entertainment excellent and the company was superb. Today we golfed in Gilroy! Beautiful California weather and the golf!!!! I did get a par and several bogey’s so I am happy. I do love to get out and play golf. Tonight we had dinner with the owners of Pan Pacific RV at Mama Mia’s in Morgan Hill – excellent Italian food – Now I need a nap! 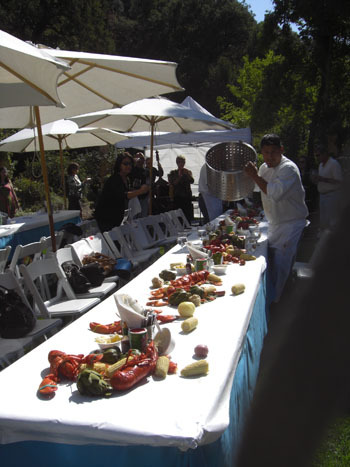 We relocated to Morgan Hill on Monday from Calistoga and will be here until early November. Paul is setting up the computers & phones for the new Pan Pacific RV Center in Morgan Hill due to open November 1st. I will be catching up with my girls and enjoying some golf if the weather gets back to normal. Yesterday it rained all day so I stayed in and quilted, watched TV and finished an excellent book, Olive Kitteridge by Elizabeth Strout. I would recommend to all of my girlfriends that this is a must read. You will find yourself in some part of the main character, Olive I assure you. 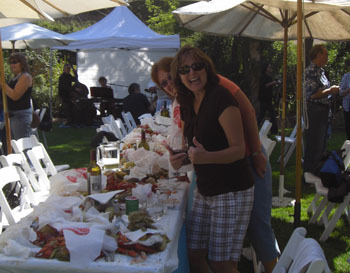 What a great time we had, camping in Calistoga at one of our favorite places, golf, great friends and then there was the LOBSTER! We left Sugar Barge RV resort on Wednesday and traveled to Calistoga where we met up with our friends, The Garveys, Tennants, and Kings at the Napa County Fairgrounds in Calistoga. On Thursday I played 18 holes of golf and we won’t report the scores (I am not even sure you can report those scores!). Friday was another beautiful day and I played another 9 holes enjoying a much better day of golf – still not low scoring however I felt way better about the game on Friday than Thursday! 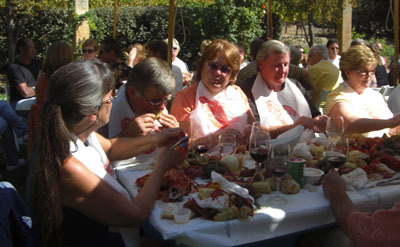 Saturday we went to Zahtila Vineyards for their Lobster Festival and to enjoy some of their fine wines – all you can drink! Paul didn’t want to spend the $85 so he was our driver and it is a good thing cause even though it was only a mile away from the fairgrounds I don’t think any of us should have been behind the wheel. 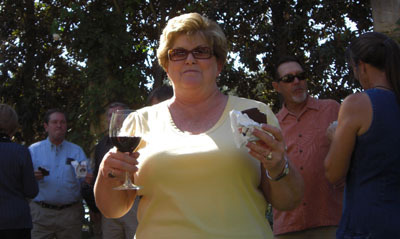 Janet also had a friend from Clearlake join us, Kathleen. You would have never known Kathleen had not been part of the group forever and the afternoon was wonderful. We arrived at the vineyards about noon and our first tasting was the 2007 Chardonnay, a very nice chilled wine for afternoon sipping. 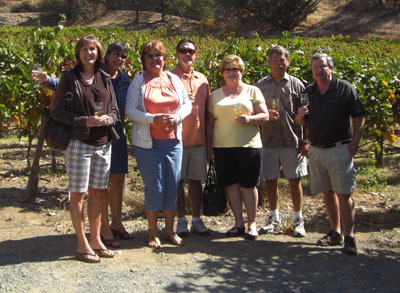 We did sip the Chardonnay and then it was on to serious wine tasting – the REDS! There were 60 people attending the Festival and there was plenty of wine to drink and food to eat. Laura Zahtila’s winery is very small and each time I have been to the winery she is usually on the grounds. 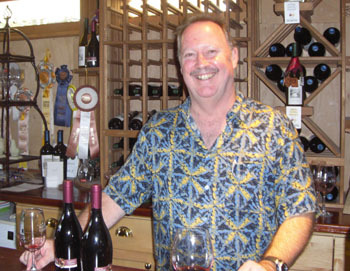 It is fun to meet the person responsible for what the wines are. 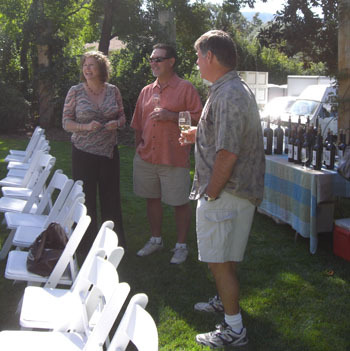 During the afternoon we tasted two Zinfandel’s & two Cabernets. The Oat Hill Estate Zinfandel was my favorite. The wine was excellent and we all made sure our glasses were full before sitting down to this feast! 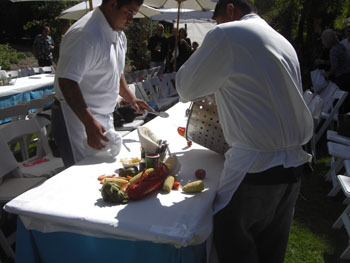 The food is poured onto the table and there are no utensils. 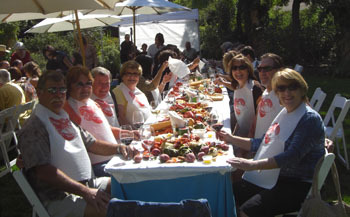 Lobster, artichokes, potatoes, bread, shrimp, onion, garlic, corn, & sausage all eaten with only your hands. The biggest challenge was which part of the Lobster do you eat and how do you get the hairs off the heart of the artichoke! Cleanup was very quick; There was so much food left on the table that we wondered what they did with it all – feed it to chickens! Now there are some “happy chickens”. Lunch was not over – we have dessert! Is that Ice Cream & Red Wine? Dessert followed the theme of the day – no utensils. These little ice cream bars tasted like a HOHO cupcake with an ice cream filling. Chocolate & Red Wine – yum. This is the guy (Jeff) that served me my last glass of Port and the rest of the day is a BLURRRRR…. Finally today by 10:30 am the money was put back into the account along with all the charges. We did not lose financially other than about 10 hours of my time, a week with access to my accounts and a week without the funds Stephanie so desperately needs to eat! 1. Random numbers or personal numbers are not safe from thieves; If they want your info they will get it. The only way my card number and pin could have been gotten was from a camera attached to an ATM that I used. I do not use the ATM if someone is standing next to me. I did not write my pin number anywhere and I have always had my card in my possession. 2. The bank does not have to tell you anything. The debits were made at bank ATM’s so there was probably video but you are not allowed to see it. They barely told me when the debits were made; the debits were made on the weekend so actual dates were not easily available. 3. Having a contact name & number for the person helping you at the bank will not insure you they will have a record of your claim. Each time I phoned I had to start over and hope they would get the right info so we could continue exploring the problem. Actually this is probably how I finally got my money back because when I phoned on Thursday afternoon after being told they were closing the claim I got a whole new person, started over and got a different result. 4. Going to the Branch does you very little good. 5. Don’t give up. When they tell you they are not going to help you call again and you may get a different answer. I have found this to also work with cell phone carriers. 7. Use cash as much as possible! Now I can go back to enjoying life and learning to use my new IPod! Today is Paul’s day so we get to go on a road trip! 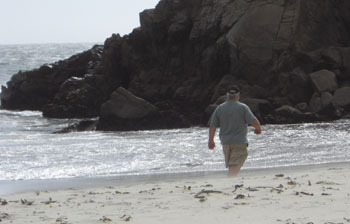 The four of us load up in the car with an ice chest full of lunch stuff and off we go to Big Sur and to his favorite beach (actually the only beach he is willing to step onto)! Heading down Hwy 101 just before Prunedale traffic stops and isn’t moving very much. Paul inputs into his GPS a route around and off we go towards San Juan Bautista and through the hills on a road that is barely paved. It is amazing how quickly you are nowhere when you step off the main routes. We end up in Salinas and continue to Monterey. When we get to Monterey the wind is blowing pretty well and the further south we go the windy it is. The drive was beautiful but it was hard to stop and enjoy so we drove until we get to the right turn that is not marked, just past Pfeiffer Big Sur State Park and make our turn onto the 2 mile trail down the canyon to the parking area for one of the most beautiful beaches we have found so far! 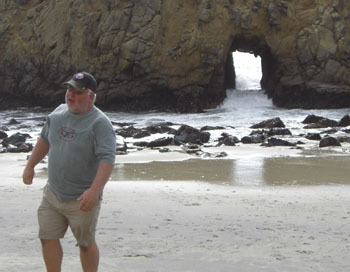 Pfeiffer Beach Paul loves this beach because of the way the rocks are formed right at the beach level and this rock with a hole that is usually filled with crashing waves. We arrive at the entrance and there is a sign posted before you pay- Yes it is windy on the beach and there are NO REFUNDS! We drove all the way here, how bad could it be? We pay our $5 and proceed to the parking area. 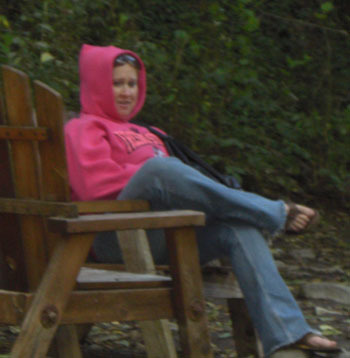 We ate our picnic in the car and then we bundled up as best as we could and hit the trail to the beach. Where did his legs go? It was so windy that I think I have sand implanted into any exposed skin. You could hardly walk it was so windy. 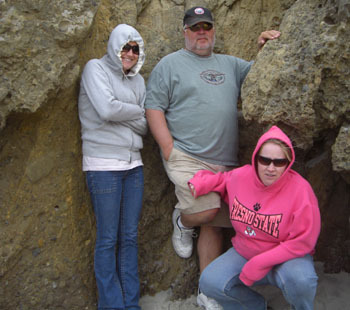 Paul and the girls too refuge against a rock as there was a little wind protection there. Check this out to see just how windy it is! Click to to watch a video of how windy it was – Not for the Queasy! We only stayed 15 minutes on the beach and everyone was ready to get back to the safety of the car. 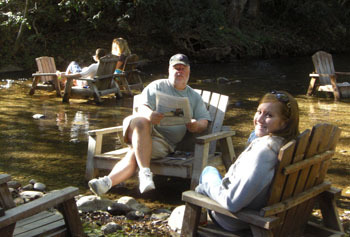 Another great place we like to stop is the Rivers Inn right at Pfeiffer Big Sur State Park and enjoy the river. The river is more of a creek through here and a very nice place to sit, enjoy a drink and read a book. Paul found a used newspaper and sat in the creek and read the local real estate listings. 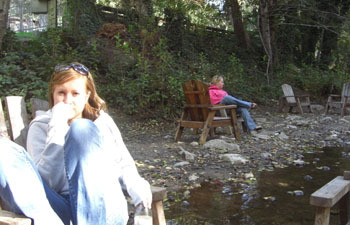 Stephanie couldn’t find a chair in the water so she had to sit all by herself! Actually she looked quite comfortable and I am not sure she wasn’t dozing by the time we were ready to leave! On our way back to Monterey, the girls and I took a nap. Monterey is always beautiful and today was not an exception. 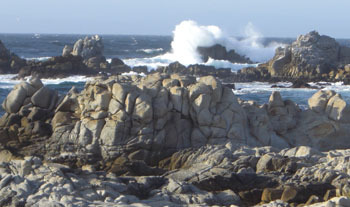 We made a stop at the beach right across the road from the Pacific Grove Municipal Golf Course for one last picture of the coastline and then we headed to Moss Landing for some more of the wonderful clam chowder from Phil’s Fish Market. WaMu or Chase or whatever they call themselves! Last Sunday evening I got a disturbing phone call from Amy. “Mom, someone took $500 out of my bank account today in Daly City!! !” I got online and sure enough there was a $500 debit taken at the bank ATM. Amy calls the bank and was told it was my card which is attached to her account. While she was speaking to the agent I was checking accounts online and saw that Stephanie also had a $500 debit from a bank ATM in Daly City – a different one. Of course I check right away to see if I have my card and if my account was also affected. My card was in my wallet just like it should be. So Amy finds out I have to call the bank cause it is my card and they won’t tell her anything. I call and then they say you can’t call until business hours, Monday 6 am till 1pm central time! Monday morning I get up file the 2 claims with the nice agent and hope they give us our money back in 7 – 10 days. Wednesday by noon there is a deposit into Amy’s account but not Stephanie’s and now Stephanies also has 4, $33.00 overdraft charges as she had used it on the weekend and the $500 made her negative. I give the Debit Fraud people a call and after much running around and a bunch of bologna the rude man named Ben who supposedly was a manager says “It isn’t Fraud, we only put the money into the first account as a courtesy and no further action will take place!” Great, someone steels my card number and my pin number that I have had for 20 years that no one knows but me, it isn’t written down, and I still have my card and I was nowhere near Daly City but it isn’t fraud, too bad lady. Well I am not that easy so after a long phone conversation I give up and let Paul try – nothing. So Wednesday we are coming to San Jose so I go to my local branch on Almaden Expressway and spend over 3 hours talking to an assistant manager who can do nothing except call the Debit Card center for me! After 2 hours he says, the Debit Card agent, myself and the Executive Office agent need to run down some info and it will take about an hour, go have some lunch and come back at 3 pm. I arrive at 3 like I am told, and I wait 30 minutes for Nic to finally come and take me to an empty cubicle without a computer and tell me ” No fraud was committed and the first $500 we put back accidentally but we are going to leave it as a courtesy!” Right, banks do such nice things for there customers all the time – When was the last time they accidentally gave you money and didn’t take it back as soon as they realized it! Anyway I go home and try to figure out our next move cause we are now short over $600 and someone has my private info. The worse part of this is I had to come up with a new pin which I have not even gotten to use yet cause I don’t have an ATM card! That is really hard, at my age I am not sure how long my mind is going to retain a random number! Interesting, Stephanie goes to B of A and opens an account so she can pay rent and they give her checks and a temporary ATM card on the spot! Finally on Wednesday before they close I get someone in the Fraud Department that says , “I think we should look at this further and I will have my manager call you tomorrow morning! Wednesday was a waste! I filed a police report and contacted the Santa Clara District Attorneys office. On Thursday, Amy and I had to travel to Hanford to get her belongings out of storage and on the way home I get a call from the District Attorneys office and was told that I should file a claim and they can make the bank give them any evidence they have uncovered. Right after that I get a call from another person at WaMu Debit Fraud Department who says “I reviewed your claim and it was Fraud and your money will be redeposited by close of business today or first thing Friday morning! Yeah! And the overdraft charges too! Yeah! Well the money wasn’t there on Friday by 11 am so I am on the phone again to the Debit Fraud department and get another supervisor which I have to explain everything to because for some reason the bank does not write anything down and there are no notes about my claim! After at least another hour with Calvin I think he finally understands the situation and may want to help (? I have been wrong before). Anyway he tells me his manager is in a meeting and he will have to wait until she is done to get authorization to put the money back! I feel like a YoYo! At 2 pm he calls and says the manager is still in the meeting and he or the manager will call me by 4 pm central time! Well here is is Saturday night and Stephanie’s account is still $550 negative and no phone calls from anyone!!!! We do get daily emails and text messages telling us our account has insufficient funds and we need to deposit funds into the account! Yeah, I will do that just as quickly as they are giving me my money back! B of A is looking better and better! I will let you know what happens on Monday! Posted in California | Comments Off on WaMu or Chase or whatever they call themselves!